Yesterday, I filmed a kitchen tour for you all. I've never done a voiceover before, but I wanted to talk about what we have behind every cupboard door and drawer. Hope you enjoy. The Haworth Family (4 Generations). My husband's paternal grandfathers line. 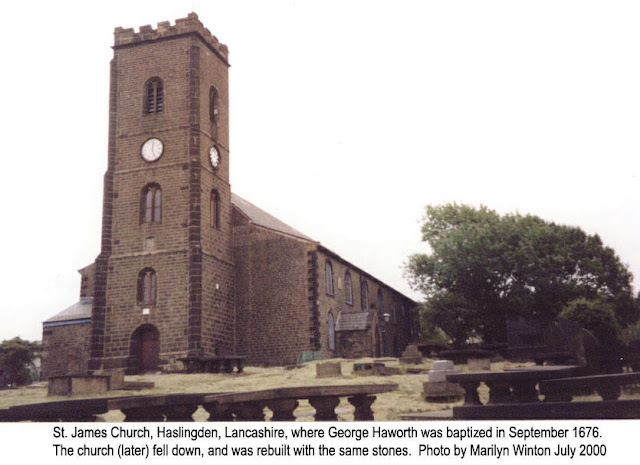 Newchurch is the location of the church where George's father, James Haworth is buried. 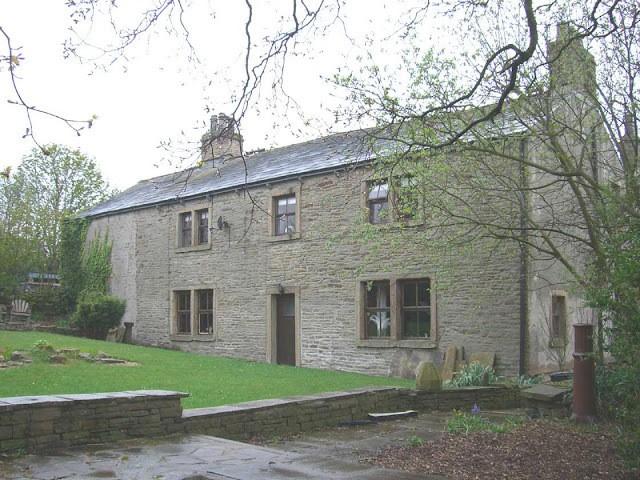 One of James and Isabel's sons, James, was a tenant of the farm. Hapton Hall was rented by James Haworth, brother of George Haworth. 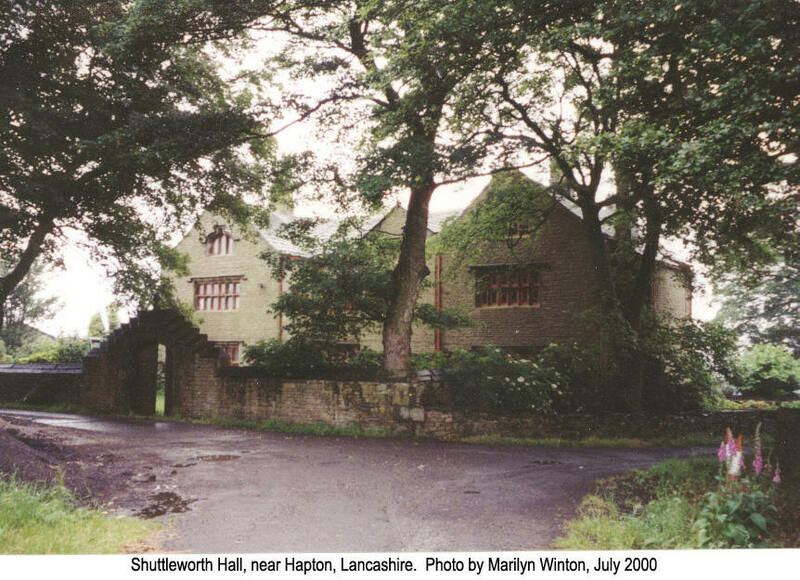 Isabella Radcliff Haworth (their mother) died there in 1707. 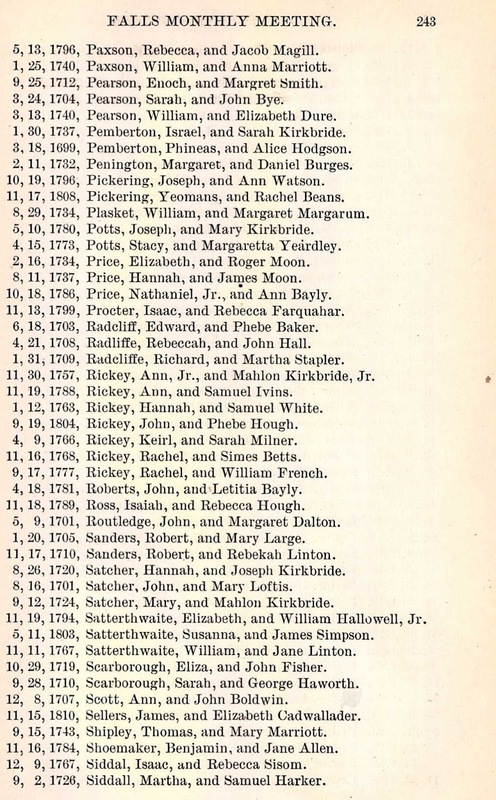 "Whereas George Haworth of ye Township of Makefield in ye County of Bucks & Province of Pennsylvania, Weaver, and Sarah Scarborough, daughter of John Scarborough of ye township Solebury in ye county and province aforesaid, spinster, having intentions of taking each other in marriage did publish ye same before several monthly meetings of ye people called Quakers in ye county aforesaid according to ye good order used amongst ye, whose proceedings therein after a deliberate consideration thereof & having consent of relations and parties concerned nothing appearing to obstruct were approved of by ye at meetings." "Now these are to certify all whome it may concern yt for ye full accomplishment of their said intentions this 28th day of 9 mo/anno 1710 they ye sd George Haworth and Sarah Scarborough appeared in a publick meeting of ye said people and other matt together at their usual meeting house in ye township of Buckingham and County aforesaid and ye ad George Haworth taking ye ad Sarah Scarborough by ye hand did in a solemn manner openly declare yt he took her to be his wife and did likewise promise to be to her a true and loving and faithfull husband untill death should seperate ym & yn and there in the said assembly she ye ad Sarah Scarborough did likewise declare yt she took ye ad George Haworth to be her husband promising to be unto him a loving and faithfull and true wife untill death should seperate them and moreover ye ad George-Haworth & Sarah Scarborough, (she according to ye custom of marriage assuming ye name of her husband) as a further confirmation thereof did then and there to those present sett their hands & we whose names are hereunder subscribed being amongst others psent at ye solemnization of their ad marriage and subscription in manner aforesaid as witnesses thereunto have also to these psents set our hands ye day & year above written." George Haworth would have been born about 1680 in Lancashire, England. As a young man, he became a Quaker and accepted William Penn's invitation to come to America and be free of religious persecution. 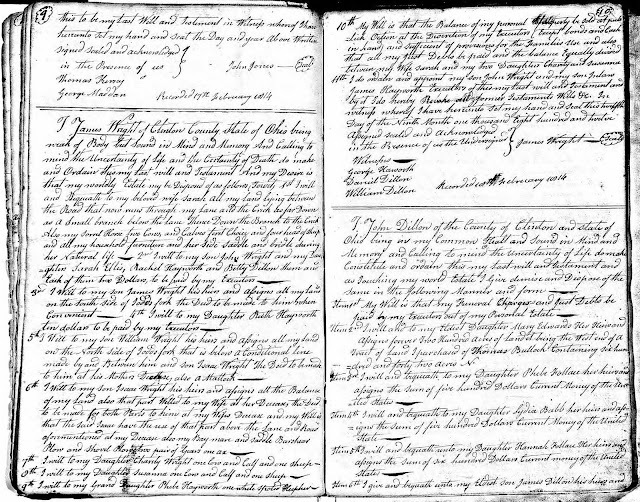 In 1699, George Haworth came to America with his sister and her husband. They were at sea some fourteen weeks and endured the hardships of such a long journey. His sister and brother in law, as well as many others died at sea. The Canaday Family History Addenda North Carolina Families Page 4 A very good account of this voyage is contained in a letter that George wrote his mother a few weeks after arriving in America. This transcript of that letter was obtained in a booklet put out by the Haworth Family Association at a Reunion held in Plainfield, Indiana in September of 1899. Philadelphia, 26, of 8 Mo., 1699 To my Dear Mother, Brother and Sisters: -- After my dear love to you all with my dear love to all my friends and neighbors, hoping that you are all in good health as I am at present, blessed be the Lord for the same; though I have been very weakly at sea in the latter end of our journey, but it pleased the Lord that I got on shore at a place 100 leagues short of Philadelphia, where I was informed that my Sister dwelt there at a place called "Hurbells", and so much in weakness I got to the place and quickly found her, and staid there one week and then set sail in a sloop for Philadelphia, for which I paid 5s. My Sister was in good health and she hath four children, two boys and two girls, and her husband being well also, and is in good health. He is a hatter to his trade. We were about 14 weeks at sea. After we left Liverpool a long and tedious journey we had, for we being thronged in the ship I believe hurt many, for we had many distempers amongst us as fevers, flux and jaundice and many died at sea about 56 and at shore there died about 20. Henry Mitchell died at sea about midway, his son John is dead also, and one Ellis Schofield and Robert Brewer are dead and he hath left his goods to be returned to his kinfolks at Liverpool. My Brother-in-law is dead and the child died also about three days before my sister. She was indifferently well most of the way, but about 100 leagues of sight of land she bore a child and it died and then she died and left her household goods to my sister and one half of the clothes and the other half she left to me. As for my Sister here, she doth somewhat incline to come to meeting; but she liveth so far remote from any meeting that she seldom goeth, but as for her husband he doth not incline to go to Friends Meetings. If my Brother, or any of my neighbors do incline to come into this country, let them be careful that they do not come too many in the ship as we did, for being thronged and the smell of many, then many fainted away and died. We wanted water and beer to drink, for having salt beef we were much a thirst and could not get enough to drink, for the seamen stowed the hold so full of goods that they had not enough room for water and beer, and then wanting such things as might have nourished us, we suffered hardships. But if any come let them buy for themselves over and besides the ship's allowance, spices, brandy and cheese, let the seamen pretend to what they will, or else victuals themselves and bargain for being carried over and goods and then bring for yourselves but a little beef and some bacon and what flour is very good, and cheese and butter and eggs and any other mild sort of food. And as for your goods you bring, let them be bedticks, very good, with all sorts of bedding. Bring no hats except very good and hardware's; so be careful of being thronged in the ship or a summer's journey, lest you be hurt as we were. 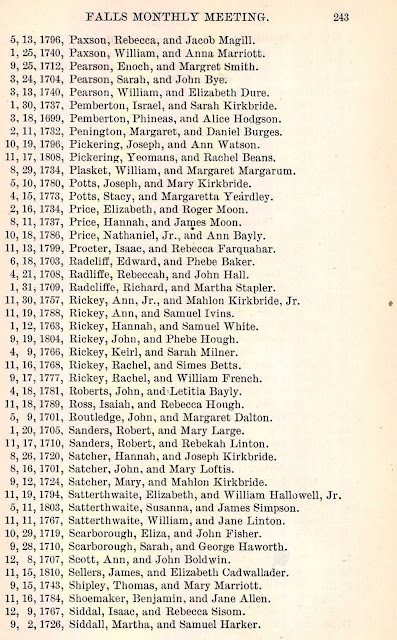 We had a The Canaday Family History Addenda North Carolina Families Page 5 very hard passage; we were brought to an allowance of water and beer and then for every four we had two cases of water and beer and then two. So no more, but very dear love to my Mother, Brother and Sisters, with the rest. 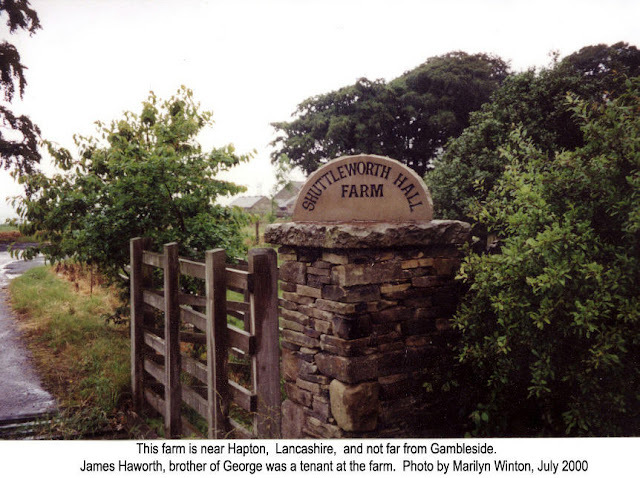 George Haworth wrote a second letter to his mother that was presented to the Haworth Gathering. 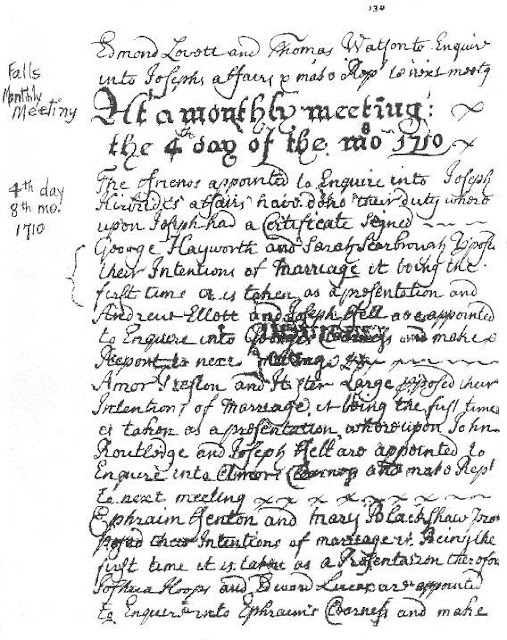 This second letter was dated `13th of the 5th Month called May 1701.' This date in itself is strange as in the old style calendar used up until 1753, the 5th month was July. Anyway it was two years later. The following are excerpts from this letter. 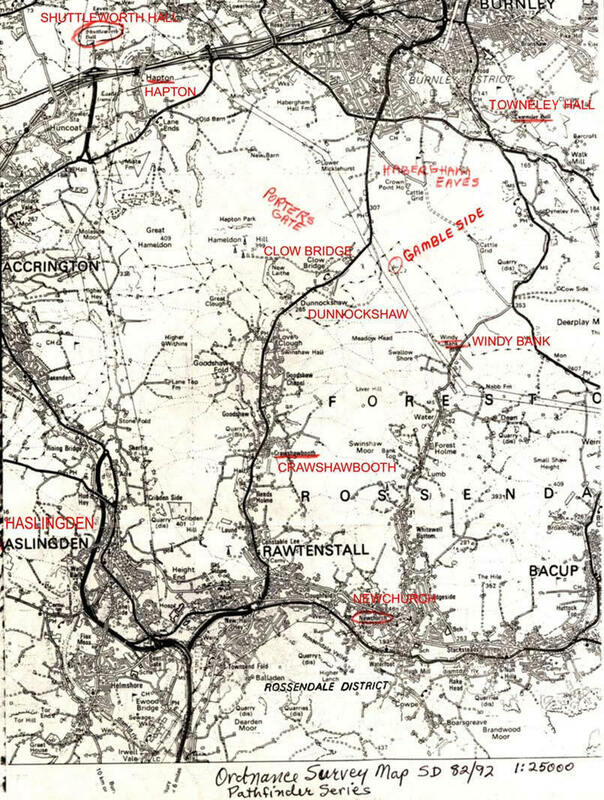 I have had my health reasonably ever since I came into the country, but at first being a little weakly I was with James Haworth, and then I hired myself for a year and I had about 10 pounds wages in the year ... So if any of my relation have a mind to come to this country I think it a very good one, and that they may do well, but be sure to come free. But if you come servants, they must be sold for four or five years work hard, so be sure to come free and bring such things as will suit plantation work, as horse chains and plough gears, and all things suitable to work with, as plough irons and things for selling. At any rate, George Haworth moved to Bucks County and purchased a tract of land some four hundred fifty acres in size and commenced farming. He also took up weaving, but farming was his main livelihood. He would remain on this very land for the rest of his life. 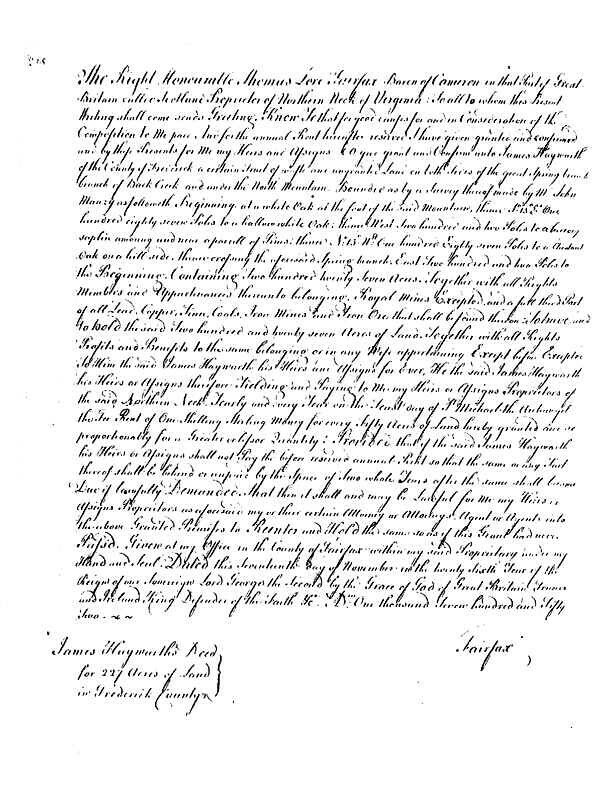 On September 28, 1710, some ten years after arriving in America, George married a young Quaker girl, Sarah Scarborough. Sarah was the daughter of John and Mary Pierson Scarborough. She was born in Buckingham township of Bucks County on March 2, 1694. 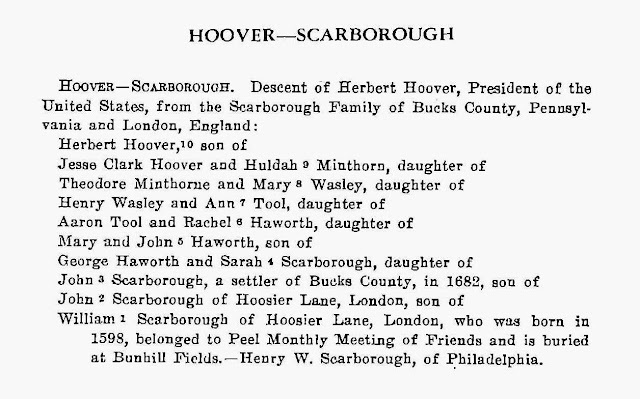 For more on this family, see the SCARBOROUGH FAMILY HISTORY, which follows. They raised seven children, their first-born died at birth, there in Bucks County. They lived near the town of Lahaska in Solebury Township. 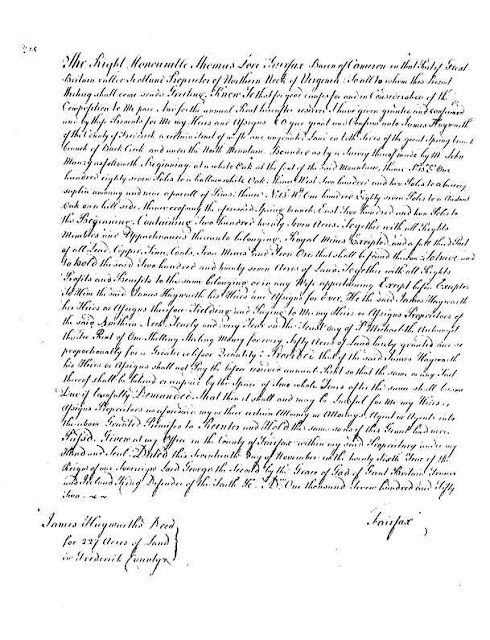 George Haworth died on November 28, 1724, and was buried at the Buckingham Family Buring Ground (FBG), Buckingham township, Bucks County. Sarah lived on for many years. In about 1731, she remarried to Mathew Hall originally from Staffordshire in England. They had four children, David, Sarah, Maholn and Margery Hall. 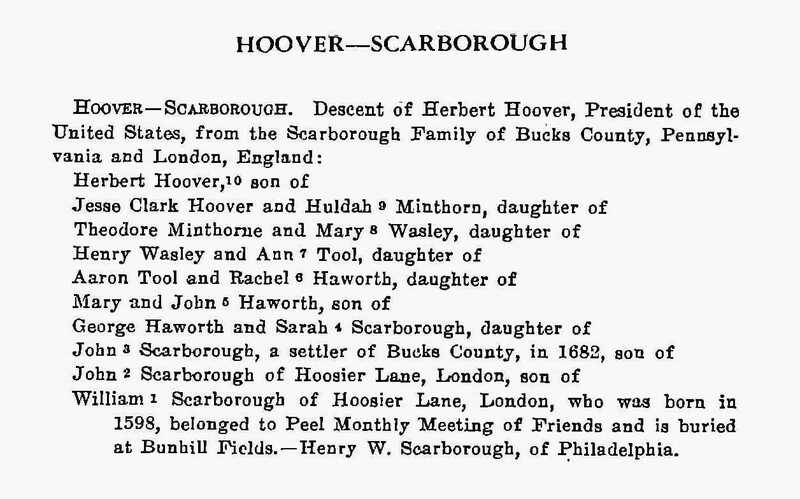 For more on the Hall children, see the following Scarborough Section. They remained in Bucks County. She died on February 4, 1748. Both George and Sarah are buried in Bucks County, in the Buckingham Friends Burial Ground. They were the 4th great-grandparents of President Herbert Hoover, the thirty-first President of the United States. 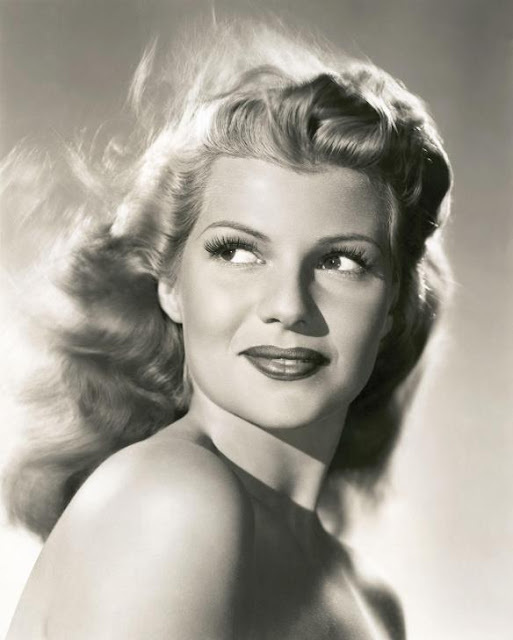 And their son, Stephanus Haworth, was actress Rita Hayworth's 5th great-grandfather. A few years ago, I inherited my Granny and Grandpa's 8mm film reels from my Dad. I was able to get them digitized, so my Dad's and Aunt's childhood memories don't fade away in a dusty old box. Part 2 has some scenes from a family trip to Germany, and from family life as expatriates in Africa. Hope you'll enjoy. Every year I like to do a post that looks back at the year. Here was our 2018. Our Childhood Snow Days and Snow Day at The Farm. Our cat Buster, aka Bubba, aka Buster P. Kitten passed away the day before Independence Day, which left us heartbroken.